Khao Soi is ramen’s cousin in Thailand—a thick, big flavored coconut broth typically served over egg noodles with a slick of coconut oil and chicken fat, pickled mustard greens to cut the richness, fried noodles for crunch, and lime and cilantro to add a refreshing kick. It’s bright and filling. This recipe from our amazing friend Chris Rabilwongse (have you tried his other recipes, like Nam Prik Ong or Noodles in Palabok Sauce?) 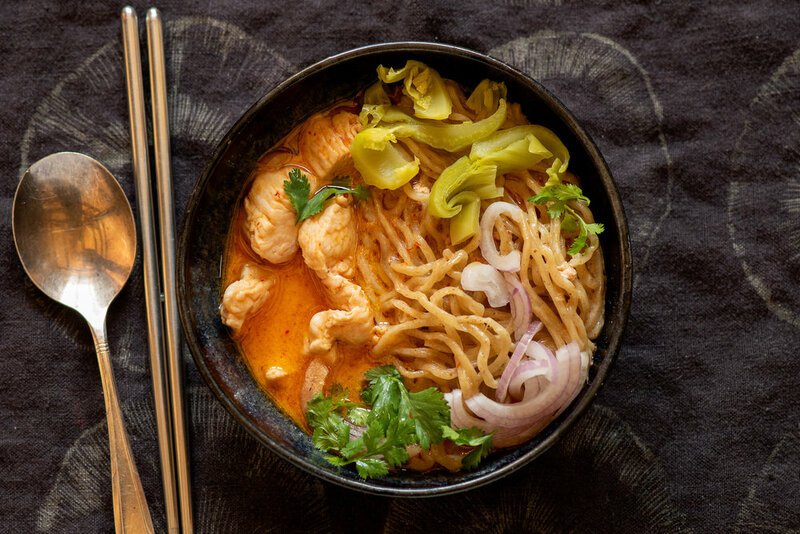 transforms the much more common red curry paste into a traditional Khao Soi with some unusual ingredients (black cardamom, for example, which are big and wrinkly and taste smokey.) If you don’t have them, don’t worry! It will still be amazing. 1. In a stock pot over medium heat, simmer coconut milk and optional black cardamom, cinnamon, and makrut peel, until oil begins to separate and small oil bubbles form at the surface. Depending on the quality of your coconut milk, this should take around 10 to 20 minutes. 2. Add red curry paste and shrimp paste to the coconut milk and break apart with a wooden spoon. Add the chicken. Simmer until fully cooked through, around 10 minutes. 3. Add chicken broth or water to the pot. When it returns to a simmer, season with fish sauce and sugar. Taste and add fish sauce for additional saltiness if desired. Depending on the spiciness of your red curry paste and your own heat tolerance, add chile flakes to taste. Continue to simmer on low while you complete the rest of the preparations. 4. Bring a large pot of water to a rapid boil. Add noodles to water and boil 2 minutes, stirring often. Drain and shake out excess water. Divide noodles between soup bowls. Ladle coconut milk broth with chicken to cover the noodles. Stir noodles in broth to loosen. Top with shallots and mustard greens. If using: Divide fried noodles among the bowls. Top with cilantro and one lime wedge. Let eaters add additional lime juice and chile oil to taste. *You may know of makrut by its more common name, kaffir lime. The term kaffir is a highly offensive racial slur in South Africa. In Southeast Asia, it’s called makrut, and henceforth, hopefully, everywhere. **We use Maesri brand red curry paste. ***Khao soi is typically topped with fried crunchy noodles. It’s not required, but it does add a nice textural contrast. You can make your own with Umi noodles! Here is how we do it: Heat a wok or sauté pan over high heat until wisps of steam rise from the surface. Add 1/2 cup vegetable oil and heat until the tip of a wooden chopstick inserted simmers upon contact (don’t worry, it will be fine. Wash it!) Gently pull apart and fluff noodles. Carefully place approximately 1/4 cup Umi Organic ramen noodles into the hot oil so they form a single layer. They should bubble vigorously. Turn over with tongs or chopsticks once they turn slightly golden, after approximately 30 seconds. Cook on the other side until slightly golden, another 30 seconds. Remove from oil and place on a plate with a paper town to drain excess oil. Repeat five more times.